Born Pretty Store Dazzling Starry Nail Art Foils were sent for review. All opinions are my own honest thoughts. Happy Caturday everyone! This is a scheduled post because I am out looking at kittens today! 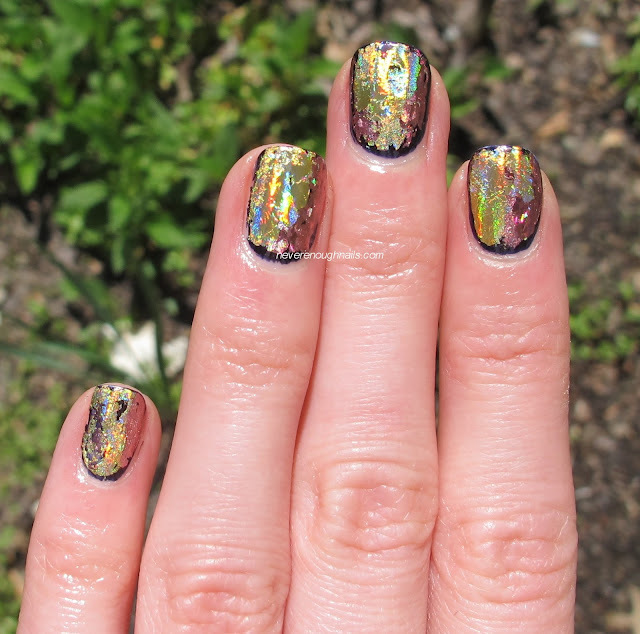 In today's post, I try my hand at nail foil for the very first time. 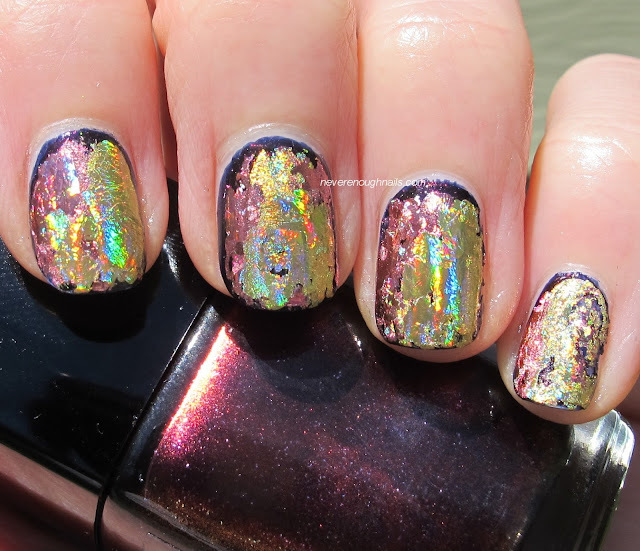 Born Pretty Store sent me these excellent Dazzling Starry Nail Art Foils for review and I decided to try them over my Chanel Taboo mani from the other day. Above, you can see the foils in #2, a smooth, reflective holographic gold foil, and #3 a kind of scattered holo pink foil. You can get three containers of foil for only $2.80 each from Born Pretty Store (with free shipping! 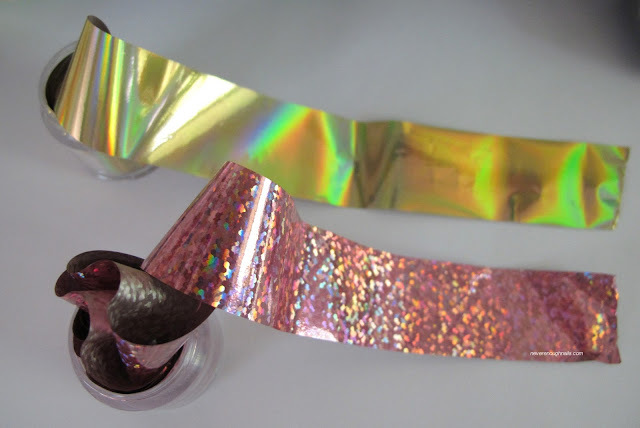 ), making these a much better deal than some of the pricier foil kits out there. 1. Prepare your nail bed by shaping, pushing cuticles back and removing all oils (do this using professional nail prep eg scrub fresh or nail polish remover. 6. Once completely dry, apply a coat to protect the foil. " The gold foil (#2) transferred to the nail really easily. There are only a few spots that you can see it didn't transfer. I decided to leave them there on purpose, for more of a random look. The pink foil (#3) was harder to get on my nail. It didn't really seem to want to transfer well. I would probably not want to try to do a whole nail with just the pink, but it was OK for mixing with the gold. What I like about this foil look is that it looks cool with some random placement. In fact, next time, I think I would try to cover less of my nail and make it look even more random. One thing I had a bit of difficulty with was determining when the polish was dry enough to apply the foil, yet still slightly damp enough for the foil to transfer. If your polish is too wet, the foil peels the polish away; if the polish is too dry, the foil doesn't transfer. However, I have a feeling this is something that you would get used to with some practice! I would definitely recommend the Born Pretty Store Dazzling Starry Nail Art Foils. They are gorgeous, come in a ton of different colors and patterns (I have the leopard print one to show you too! ), and very inexpensive! There is also a video tutorial on their website if you'd rather watch someone do it first. 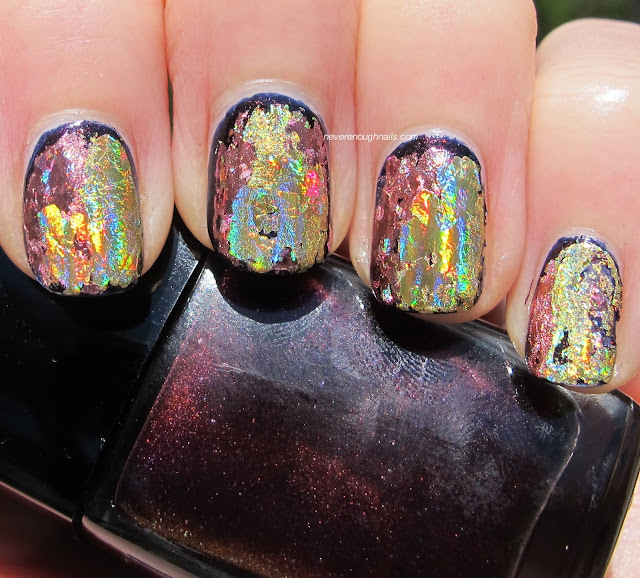 Get these pretty nail foils at Born Pretty Store! Wow this really looks like a painting! Great! Thanks Polish Alcoholic! I think I'll get used to it to so next time will be even better!